Major Poker Cheating Incident at Final Table of European Partouche Poker Tour! Poker Cheating in major poker tournaments always happens despite tournament organizers' claims that it is rare. The big-time poker cheats are currently at it in Europe...The bigger question is: What type of major poker cheat scandal(s) will we see at this year's World Series of Poker final table, which is scheduled to kick off today. Just as the most prestigious final table in the whole of tournament poker is about to get underway today at 12pm PT in Vegas, another final table has also been making headlines, but for all the wrong reasons. Poker fans everywhere are now counting down the hours until the ‘November Nine’ begin their quests to become the next WSOP 2010 Main Event Champion, as well as take down the massive $8.9 million first place prize in the process. In the meantime, however, another ‘November Nine’ across the ocean at the Palm Beach Casino in Cannes have just lost one of their numbers before the final table had even begun. Although not quite as grand as the WSOP Main Event, the Partouche Poker Tour Cannes has still a huge €1,300,000 ($1.824,190) top prize, none of which will be seen by ex-finalist Ali Tekintamgac, who has been disqualified for cheating. The 2010 WPT Barcelona Spanish Championship winner was lying 4th in chips when, according to the Partouche Poker Blog and other European poker outlets including Poker Nyhederne and 01men.com, damming video footage was produced showing Tekintamgac cheating. Apparently, Ali Tekintamgac had been receiving signals and information on opponent’s holecards by phony journalists and bloggers, in order to gain a huge advantage over his unfortunate victims. In fact, at an earlier EPT tournament in Tallinn, Tekintamgac had been at the center of a similar cheating dispute involving bloggers passing on information, who subsequently had their credentials revoked during the tournament. On that occasion Tekintamgac was allowed to continue and finished in 36th place for $10,329. 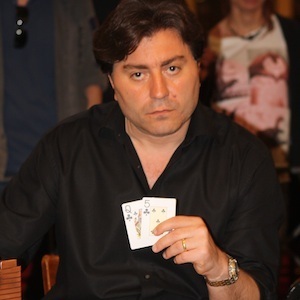 After the latest fiasco, it is believed Ali Tekintamgac is being investigated on charges of fraud by local law enforcement officers and if the allegations are substantiated, will likely be facing tournament bans from many major poker organisers at the very least. As the WSOP 2010 Main Event final table in literally only hours away, Ali Tekintamgac’s alleged cheating antics have shone more than a little unwelcome limelight on poker right in the midst of what should, in fact, be it’s crowning glory. Bahram Sahami's lawyer presented his client as a desperate Iranian man seeking asylum for the terror in Iran, claiming Sahami is a dental technician who entered the UK in 1999 after fleeing Iran soon after his brother was killed by the government. Sahami did spend time in an Iranian prison before he left the country. He quickly applied for asylum in England but his application was denied and so was a 2006 appeal. The lawyer, Andrew Hope, told the court that Sahami became a gambling addict out of desperation and blew all the money from the sale of his house in Iran before turning to casino cheating to try and recover the funds. The prosecutor, Nicola Merrick, had a different view of Sahami, saying he was skilled at sleight of hand tactics to cheat the casinos. She even described him as a "slippery customer." She then reminded the court that when the police showed Sahami video of him doing the cheat moves at the Gala casino, the defendant denied it was him on tape. He steadfastly denied all charges before changing his plea to guilty in October. The judge, Peter Testar, addressed Sahami with "It seems to me that you were an accomplished and determined cheat, as what the CCTV from the casino in Baker Street showed was you cheating in four or five different ways during the course of a limited period of time." He then gave him ten and a half months in jail, a relatively light sentence as I had suspected. UK justice is soft on casino cheats. The fact that Sahami used several false identites to continue entering casinos to apply his cheating talents did not appear to weigh in on the sentencing. Actually the famed roulette cheat, thirty-seven year-old Bahram Sahami, is originally from Iran, but he has developed a knack for cheating American-style roulette wheels in Europe. His specialty is pastposting or adding chips to bets after a winning outcome and pinching chips (removing from the layout) after a losing outcome. He is also a known chip thief, lifting chips from other players at the roulette table. Sahami has pleaded guilty to multiple counts of all three of these type of casino cheat infractions, and will be sentenced today at the Southwark Crown Court for 3 counts of casino fraud and cheating at gambling and two counts of thievery of casino chips. Sahami was also skilled at using false identities to gain entrance to European casinos, something he had to be as he'd been barred by all UK casinos for past instances of cheating. Apparently he used a half-dozen high-quality fake UK driver's licenses and ID cards to fool casino reception personnel during 2009 and 2010, becoming a member of several UK casinos. Sahami, whose average cheat move netted between $50 and $200, was last busted at a London Gala casino when he was observed pastposting on video surveillance tape. Tape was then reviewed on several shifts and more casino cheat moves were discovered. My take: This guy seems like a skilled and busy roulette cheat, but maybe he didn't move around enough. It appears he overworked London and the rest of the UK casinos, which is a dumb move for even the best of casino cheats. He will probably get minimal jail time as the UK is not very harsh with casino cheats. As soon as I have the info on his sentence I will pass it along. A thirty-six year-old Chinese construction worker named Gu Xiao Dong got three months in a Singapore prison for trying to cheat the Marina Bay Sands casino by laying down a late bet in a sic bo dice game, which is the Asian equivalent of craps. The maximum jail term for this casino-cheat crime in Singapore is five years in prison plus a fine. My take: Seems to me that all these casino cheats getting busted in Singapore are rank amateurs...construction workers, cashiers, bakers, etc. It makes me wonder just how much the REAL casino cheats are beating the twin Singaporean casinos for...believe me, it's a LOT! Isle of Man is New Haven for Online Poker Companies...What is it Doing to Protect Players Against Organized Online Poker Cheating? These days more and more online poker and casino companies are opeating out of the Isle of Man, off the coast of England, being drawn there by tax incentives offered by the island's authorities. However, questions have arisen as to the integrity of the island's online gaming services, especially in regards to online poker cheating scandals. Some serious UK online poker players crusading against cheating, especially online collusion and bot-use to cheat honest players, have travelled to the Isle of Man to personally confront government administrators in charge of the Isle of Man's online poker legislation. In light of the recent online poker cheat bot scandal in China, these players have become very worried about large scale online poker cheating. Steve Brennan, Director of Isle of Man Gambling Supervision Commission, said in response to these worries: "We try to stay one step ahead with the tracking systems to spot the patterns that would lead to collusion. We have the technology to stop them. I don't believe there is a problem with online cheats. There are always going to be some issues but they can be detected and dealt with." My take: Can't really separate the Isle of Man Commission from any other online gaming commission, so I simply say, Let's wait and see what if any major scandals hit online poker sites operating in the Isle of Man. Executives at Atlantic City Borgata Say Huge Losses at the Tables Are Not Related to Casino Cheating...What Do I Think? Here's an Atlantic City Press article about the huge casino table losses suffered in recent months by Atlantic City's Borgata Casino and Spa. Borgata Hotel Casino and Spa’s gamblers have been incredibly lucky at the gaming tables. That’s good for them, but bad for Borgata. Borgata’s luck has been so poor lately that it has cost Atlantic City’s top-grossing casino millions of dollars in revenue and prompted some intriguing speculation. One gaming analyst wondered about the possibility of a cheating ring. “Do you think there’s some sort of collusion or do you have some sort of cheating going on, or is it just a change in consumer behavior?” Adam Steinberg, of Merriman Capital, bluntly asked during a conference call last week on Borgata’s third-quarter earnings report. Steinberg posed the question after executives at Borgata’s parent company, Boyd Gaming Corp., complained that the casino took a $9 million revenue hit during the quarter because of its unusually low table games hold percentage. In the third quarter, Borgata’s net revenue shrank to $207.7 million, a nearly 7 percent decline from $222.6 million a year ago. Even worse, gross operating profits plunged 19.7 percent to $54.3 million for the quarter, the company reported. The “hold percentage” is the term for the ratio of gaming chips the casino keeps compared with the number it sells to gamblers. For example, if a blackjack player buys $200 in chips and loses $30 in bets, the hold percentage for the casino is 15 percent. Borgata’s table games hold in the third quarter this year was 12.09 percent, more than 2 percent lower than its average of 14.34 percent from 2005 to 2009, according to figures released by the casino. The hold was 13.77 percent in the second quarter this year and 13.62 percent in the first, also below historic levels. Dave Coskey, Borgata’s vice president of marketing, said the casino conducted an internal review in September and found no irregularities with the table games. For security reasons, he would not divulge the exact nature of the checks. In the end, Borgata officials concluded that gamblers simply had a hot streak. “We’ve always said that Borgata can be your lucky place. Our customers proved that during this month,” Coskey said. While security checks this time did not uncover anything wrong, Borgata has not been immune to illicit gambling. In 2007, authorities broke up an illegal sports-betting operation that had been run out of Borgata’s high-stakes poker room. Authorities praised the casino for its cooperation in helping them to crack the betting ring. My Take: Well, the Borgata, as we all know, has been the locale of some high-profile poker cheat and illegal-betting cheat scams, so we can't rule out something "cheaty" going on here now. If there indeed is organized cheating going on, whether or not it may involve Borgata personnel, I would bet every nickel that it's got something to do with the casino's high-stakes baccarat tables, which are the usual suspects these days in major continuous brick and mortar casino cheat operations. So, I'd say it's fifty-fifty that at least some big time cheating is happening at the Borgata casino.